Alfonso VI (before June, 1040 – June 29/July 1, 1109), nicknamed the Brave (El Bravo) or the Valiant, was King of León from 1065, King of Castile and de facto King of Galicia from 1072, and self-proclaimed "Emperor of all Spain". 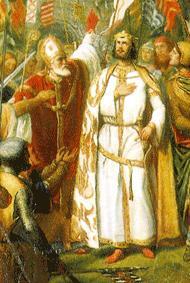 After the conquest of Toledo he was also self-proclaimed victoriosissimo rege in Toleto, et in Hispania et Gallecia. Much romance has gathered around his name. AccessionAs the middle of three sons of King Ferdinand I of León and Sancha of León, Alfonso was allotted León when the kingdom was divided following his father's death, while Castile was given to his elder brother Sancho, Galicia to younger brother García, and sisters Urraca and Elvira given the cities of Zamora and Toro respectively. Each of the brothers was also assigned a sphere of influence among the Taifa states. Alfonso appears to have taken the first step in violating this division, in 1068 invading the Galician client Taifa of Badajoz and extorting tribute. In response, Sancho attacked and defeated Alfonso at Llantada but three years later in 1071 they joined forces against García. Sancho over-marched Alfonso's León to conquer García's northern lands, while Alfonso himself is found issuing charters in the southern part of the Galician realm. García fled to taifa Seville, and the remaining brothers then turned on each other. This conflict culminated in the Battle of Golpejera in early January, 1072. Sancho proved victorious and Alfonso himself was forced to flee to his client Taifa of Toledo. Later that year as Sancho was mopping up the last of the resistance, besieging his sister Urraca at Zamora in October, he was assassinated, opening the way for Alfonso to return to claim Sancho's crown. García, induced to return from exile, was imprisoned by Alfonso for life, leaving Alfonso in uncontested control of the reunited territories of their father. In recognition of this and his role as the preeminent Christian monarch on the peninsula, in 1077 Alfonso proclaimed himself "Emperor of all Spain". In the cantar de gesta The Lay of the Cid, he plays the part attributed by medieval poets to the greatest kings, and to Charlemagne himself. He is alternately the oppressor and the victim of heroic and self-willed nobles — the idealized types of the patrons for whom the jongleurs and troubadours sang. He is the hero of a cantar de gesta which, like all but a very few of the early Spanish songs, like the cantar of Bernardo del Carpio and the Infantes of Lara, exists now only in the fragments incorporated in the chronicle of Alfonso the Wise or in ballad form. His flight from the monastery of Sahagún (Safagún in Leonese language), where his brother Sancho endeavoured to imprison him, his chivalrous friendship for his host Almamun of Toledo, caballero aunque moro, "a knight although a Moor", the passionate loyalty of his vassal, Pero (Pedro) Ansúrez, and his brotherly love for his sister Urraca of Zamora, may owe something to the poet who took him as a hero. They are the answer to the poet of the nobles who represented the king as having submitted to taking a degrading oath at the hands of Rodrigo Díaz de Vivar (El Cid) to deny intervention in his brother's death in the church of Santa Gadea at Burgos, and as having then persecuted the brave man who defied him. Strong fighterWhen every allowance is made, Alfonso VI stands out as a strong man fighting as a king whose interest was law and order, and who was the leader of the nation in the reconquest. He impressed himself on the Arabs as a very fierce and astute enemy, but as a keeper of his word. A story of Muslim origin, which is probably no more historical than the oath of Santa Gadea, tells of how he allowed himself to be tricked by Ibn Ammar, the favourite of Al Mutamid, the King of Seville. They played chess for an extremely beautiful table and set of men, belonging to Ibn Ammar. Table and men were to go to the king if he won. If Ibn Ammar gained he was to name the stake. The latter did win and demanded that the Christian king should spare Seville. Alfonso kept his word. Whatever truth may lie behind the romantic tales of Christian and Muslim, we know that Alfonso represented the two great influences then shaping the character and civilization of Hispania. Alfonso showed a greater degree of continental integration than his predecessors. The marital practices of the Iberian royalty had been largely endogamous, previously limiting choice of partners to the peninsula and Gascony, but Alfonso married French and Italian wives, while marrying daughters to French princes and an Italian king. His second marriage was arranged, in part, through the influence of the French Cluniac Order, and Alfonso is said to have introduced them into Iberia, established them in Sahagun and choosing a French Cluniac, Bernard, as the first Archbishop of Toledo after its 1085 conquest. He also drew his kingdom nearer to the Papacy, a move which brought French crusaders to aid him in the reconquest, and it was Alfonso's decision which established the Roman ritual in place of the old missal of Saint Isidore — the Mozarabic rite. On the other hand he was very open to Arabic influence. He protected the Muslims among his subjects and struck coins with inscriptions in Arabic letters. He also admitted to his court and to his bed the refugee Muslim princess Zaida of Seville. Alfonso was defeated on October 23, 1086, at the battle of Sagrajas, at the hands of Yusuf ibn Tashfin, and Abbad III al-Mu'tamid, and was severely wounded in the leg. In 1067, two brothers from Iberia are said to have competed for the hand of Agatha, one of the daughters of William I of England and Matilda of Flanders and formerly fiancee of Harold Godwinson. Alfonso proved successful, and was betrothed to Agatha. A nun at the time, Agatha is said to have prayed for death rather than being forced to marry Alphonso, and she died before the marriage could take place. Epitaph of Jimena Muñoz, Alfonso's mistress and progenitor of the first Portuguese royal lineIn 1069, Alfonso married Agnes of Aquitaine, daughter of William VIII of Aquitaine and his second wife Mateoda. They last appear together in May 1077, and then Alfonso appears alone. This suggests that she had died, although Orderic Vitalis reports that in 1109 Alfonso's 'relict' Agnes remarried to Elias I of Maine, leading some to speculate that Alfonso and Agnes had divorced due to consanguinity. It seems more likely that Orderic gave the wrong name to Alfonso's widow, Beatrice. Agnes and Alfonso had no children. Apparently between his first and second marriages he formed a liaison with Jimena Muñoz, a "most noble" (nobilissima) concubine "derived from royalty" (real generacion). She appears to have been put aside, given land in Ulver, at the time of Alfonso's remarriage. By her Alfonso had two illegitimate daughters, Elvira and Teresa. His second wife, who he married by May 1080, was Constance of Burgundy, daughter of Robert I, Duke of Burgundy. This marriage initially faced papal opposition, apparently due to her kinship with Agnes. Her tenure as queen consort brought significant Cluniac influences into the kingdom. She died in September or October, 1093, the mother of Alfonso's eldest legitimate daughter Urraca, and of five other children who died in infancy. Either before or shortly after Constance's death, Alfonso formed a liaison with a second mistress, Zaida of Seville, said by Iberian Muslim sources to be daughter-in-law of Al Mutamid, the Muslim King of Seville. She fled the fall of Seville for Alfonso's kingdom in 1091, and soon became his lover, having by him Alfonso's only son, Sancho, who, though illegitimate, was apparently not born of an adulterous relationship, and hence born after the death of Constance. He would be named his father's heir. Several modern sources have suggested that Zaida, baptised under the name of Isabel, is identical with Alfonso's later wife, Queen Isabel (or that she was a second queen named Isabel whom he married in succession to the first). Zaida/Isabel died in childbirth, but the date is unknown, and it is unclear whether the child being delivered was Sancho, an additional illegitimate child, otherwise unknown, or legitimate daughter Elvira (if Zaida was identical to Queen Isabel). By April 1095, Alfonso married Bertha. Chroniclers report her as being from Tuscany, Lombardy, or alternatively, say she was French. Several theories have been put forward regarding her origin. Based on political considerations, proposals make her daughter of William I, Count of Burgundy or of Amadeus II of Savoy. She had no children and died in late 1099 (Alfonso first appears without her in mid-January 1100). Within months, by May 1100, Alfonso again remarried, to Isabel, having by her two daughters, Sancha, (wife of Rodrigo González de Lara), and Elvira, (who married Roger II of Sicily). A non-contemporary tomb inscription says she was daughter of a "king Louis of France", but this is chronologically impossible. It has been speculated that she was of Burgundian origin, but others conclude that Alfonso married his former mistress, Zaida, who had been baptized as Isabel. (In a novel twist, Reilly suggested that there were two successive queens named Isabel: first the French (Burgundian) Isabel, mother of Sancha and Elvira, with Alfonso only later marrying his mistress Zaida (Isabel), after the death of or divorce from the first Isabel.) 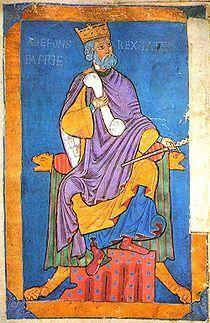 Alfonso was again widowed in mid-1107. By May 1108, Alfonso married his last wife, Beatrice. She, as widow of Alfonso, is said to have returned home to France, but nothing else is known of her origin unless she is the woman Orderic named as "Agnes, daughter of William, Duke of Poitou", who as relict of Alfonso, (Agnetem, filiam Guillelmi, Pictavorum ducis, relictam Hildefonsi senioris, Galliciae regis), remarried to Elias of Maine. If this is the case, she is likely daughter of William IX of Aquitaine and niece of Alfonso's first wife. Beatrice had no children by Alfonso. One other woman was reported by later sources to have been Alfonso's lover. The historian Abu Bakr Ibn al Sayraff, writing before 1161, stated that Alfonso abandoned Christianity for Zoroastrianism and had carnal relations with his sister Urraca, but then repented and was absolved, making pilgrimages to holy sites as penance. This has been followed by some later historians but others dismiss it as propaganda or misunderstanding. 1 Bernard F. Reilly, "The Kingdom of Leon-Castila under King Alfonso VI, 1065-1109" (Princeton University Press, full text online at LIBRO).